It’s been a particularly rough cold/flu season across the nation. And whether you and your children were spared from the circulating nasty bugs or spent some miserable days (or even weeks) home with chicken soup in tow, we get sick about 200 times in our lifetime. Of those 200 different illnesses, about 50% of them typically occur in the first ten years of life. And we know, parents…that’s just rough. We feel your pain. 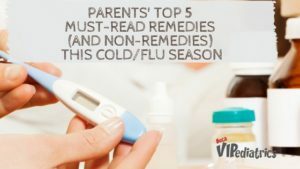 So we’ve compiled our must-read list on cold remedies and myths to help you get through this particularly difficult flu season. The most common illness that a child will get (over and over) is the common cold – which comes from a virus. Antibiotics do not treat colds, and because we’re not big fans of overprescribing or over-medicating, we like to go with natural remedies first. Sometimes I get a text or email from a parent describing the all-too-familiar stuffy nose, fever, and cough trifecta. With a same day visit to my office, I ask specific questions about the duration and symptoms of the cold as well as findings on their exam (ears, nose, throat, heart, lungs, etc.) that help the me determine if the illness is most likely from a common circulating virus or from a bacteria. The reason why we don’t “just give the antibiotic” is that like all medications, antibiotics can have side effects. From upset stomach to diarrhea, antibiotics can kill off the good bacteria that lives in our intestines and can cause more harm than good when they are used in situations where they are not needed. Additionally, taking unnecessary antibiotics can also create antibiotic resistance. This means that if your child does get a bacterial infection at a later date, the infection may not be able to be treated with first or second option antibiotics and may require much stronger medications or antibiotics that are only available through an IV (which would require hospitalization). The good news is that the vast majority, greater than 75% of infections are from common viruses that will clear on their own with the help of your child’s immune system. Even some bacterial infections can clear without needing antibiotics. Antibiotics only treat bacterial infections. There are no antibiotics to kill a viral infection which is why the majority of illnesses are not treated with antibiotics. Honey is a natural sweet substance that is revered not only for its taste, but also its antioxidant and antimicrobial effects. In numerous published studies, children who had symptoms of cough and runny nose were given 10 grams (about 1 teaspoon) of honey 30 minutes prior to sleep. Parents reported a significant improvement in their child’s cough the night they were given honey vs. the previous night where no treatment was given. (Don’t forget to brush their teeth before bed!). Additionally, these studies have shown that the over-the-counter cough medications available work no better than placebo (i.e. no treatment at all). And, the over-the-counter cough medications often contain multiple ingredients which can cause adverse side effects in children and create risks for overdosing. Never give honey to an infant who is less than 1 year old due to the risk for infection with infant botulism (a serious bacterial infection). *To refresh your memory on why coughing is actually a good thing for your child when they are sick, read this! When noses are stuffy and your child is feeling congested, using a humidifier in their room at night may help provide some symptomatic relief. Sitting in a shower to breathe in the steam can also be helpful, just be careful not to let your child get burned by the hot water. If your bathroom configuration allows it, you can also run the shower on hot and sit in the bathroom playing with your child while the room steams up – creating your own personal steam room! *For those using humidifiers, make sure to clean out the water in the humidifier every day. Mold can grow in as little as 24 hours in humidifiers, so be sure to change out that water! Your grandmother was right again! Chicken soup DOES actually help with remedy the common cold. Between the heat of the soup, the salt, and nutrients in the broth (veggies, spices, nutrients, etc.) chicken soup can help soothe sore throats and may help improve mucus in the nose. And as most of us can attest, a bowl of homemade soup made really does cure what ails ya! You see it on Facebook, Instagram, and in the aisles of the grocery store, everyone seems to be hawking vitamins, elixirs, syrups, etc. during cold and flu season. See, the thing is that vitamins sold in stores (or from a person on facebook) are not FDA regulated, meaning that there is no oversight to know that what is actually in the bottle! This means that much of what you are buying may just be flavor fillers and you may be throwing $$$ down the drain (or rather urinated out in the toilet). Instead of getting into the vitamin debate, it’s best for all of us to remember that eating actual fruits and veggies is the best way to get daily vitamins and nutrients. This way, you know what you’re buying is real and you can make it fun for your child to get their fruits and veggies. For those picky eaters (isn’t that all kids?) – homemade smoothies or popsicles are great ways to get fruits and veggies in their diet! There are even real veggie powders that can be sprinkled into any food or drink! Whatever this cold/flu season brings, remember that parental instinct is important and if you’re ever concerned about your child, your pediatrician should be in the loop. Frequent hand washing, along with a great relationship with your pediatrician are the keys to happy and healthy days!